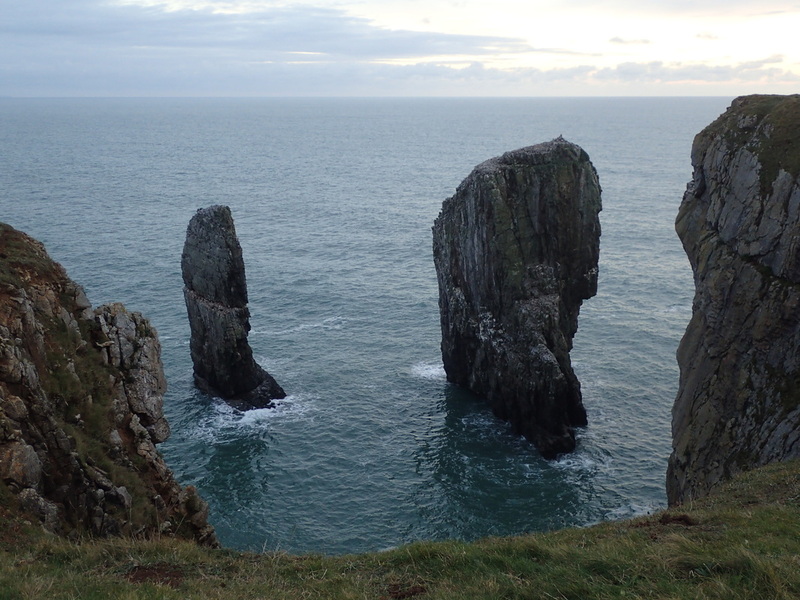 I’d passed the Elegug stacks a number of times on the walk in from Stack Rocks car park towards climbing on Bow Shaped Slab, Crystal Slabs and Crickmail Point, though I wasn’t aware of the Pen-y-Holt stack until I bought the new Climber’s Club guide to Range West. While the access to Pen-y-Holt looked straightforward, I hadn’t appreciated that you needed to attend a briefing to access all of Range West. 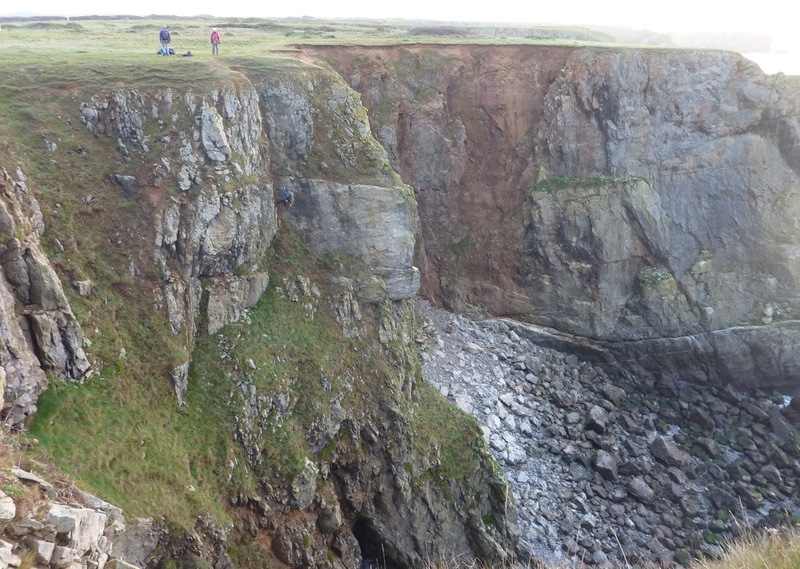 The climbing throughout the guide looked fantastic so I contacted the Range Office about the dates of the briefing meetings held at Castlemartin Army Camp. There seem to be about eight briefing dates per year between February and May and we attended one in the evening, arriving early following advice not to be a minute late and in time to park by the tanks at the entrance of the base. The briefing was pretty full, but the vast majority of those attending were fishermen, with only a few surfers and climbers. 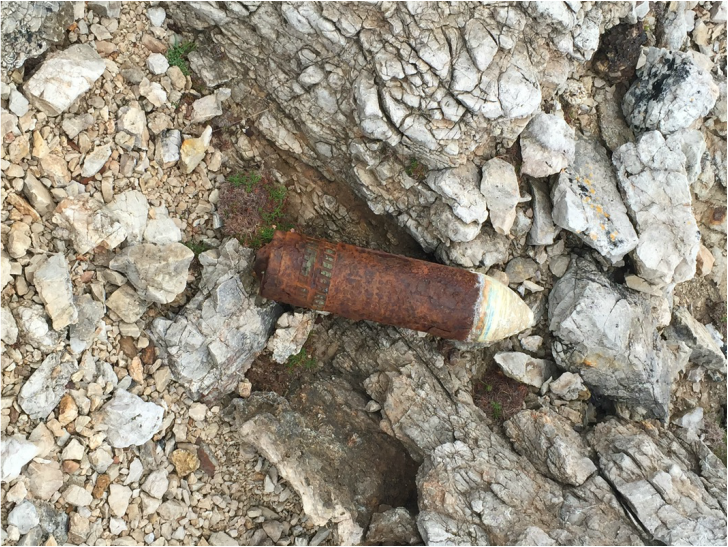 The briefing was interesting and fundamentally to advise you not to touch anything on the range - which could well be unexploded ammunition - or to stray off the coast path beyond the white markers onto the range. With your details captured at the briefing, every time you wish to climb on Range West, you need to check into the gate house where you are given a photographic pass for each and every visit. The first time at the gate house you need to present photo ID and have you photograph taken, but thereafter it takes just a couple of minutes and there was no issue with getting a pass in the early morning or returning it late in the day. 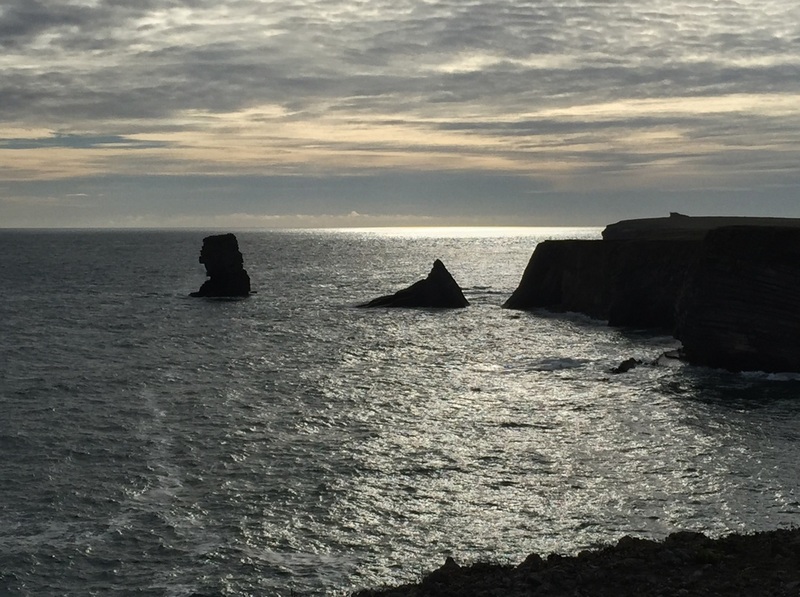 In addition to the pass, if you use the Gupton Gate rather than Stack Rocks access, then you get a key for the gate that you need to return at the end of the day along with your pass. 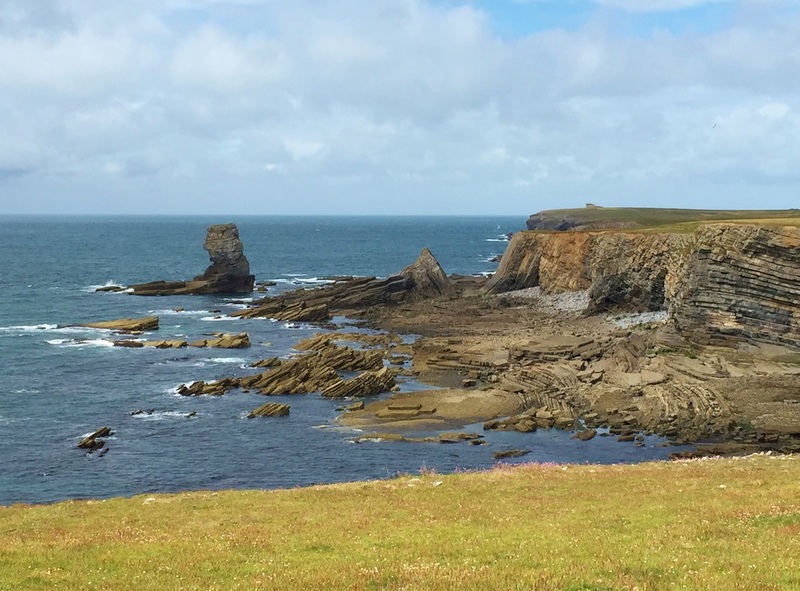 On our first trip we parked at Gupton Gate and over the course of a weekend saw only two other climbers – fantastic to have such an amazing stretch of coastline almost to yourself. 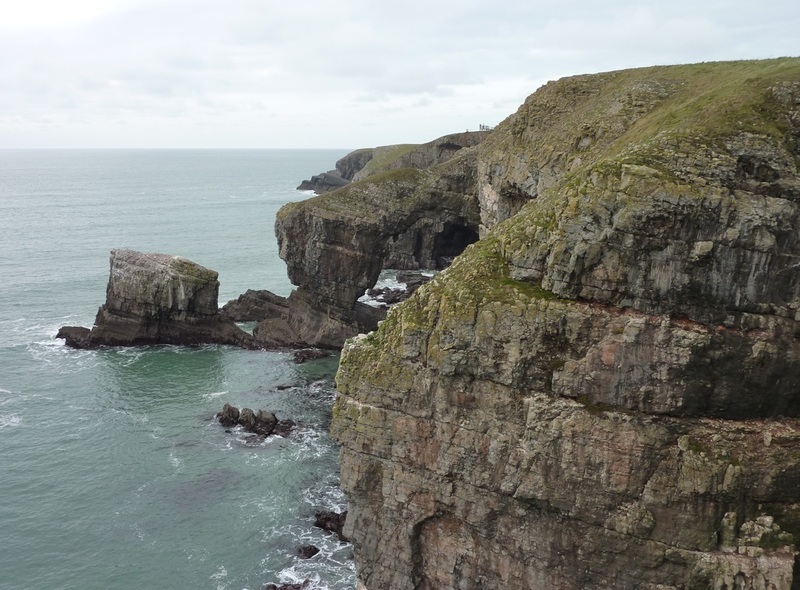 The cliff top is well marked with yellow posts that highlight the location of some of the main climbing areas and red markers highlight the nesting restriction locations, helping you interpret the map available from the gatehouse that identifies any climbing limitations. 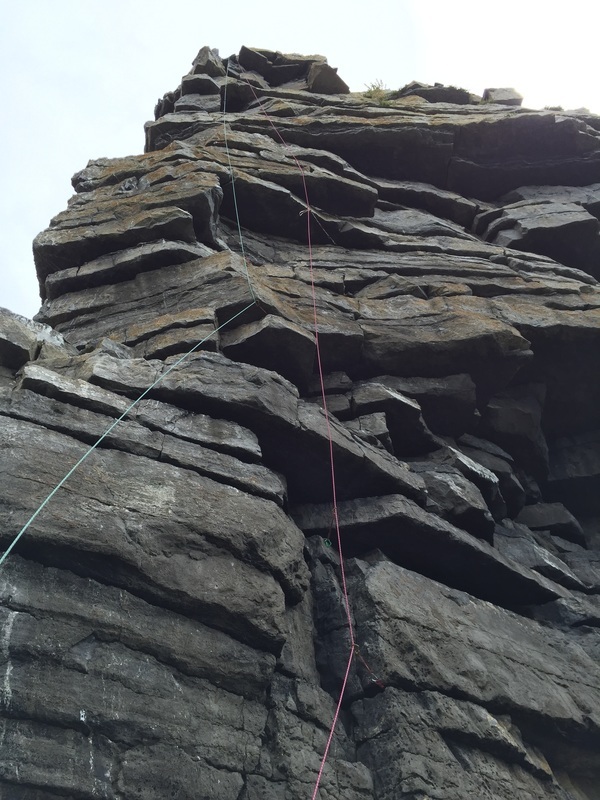 On our first visit we climbed at Still Slab, Western Walls South and Christmas Chasm Wall, enjoying some unstarred VS routes as well as the excellent 3* S 4a, Bellringer. We also went to look at Pen-y-Holt stack and decided that had to be the focus of our next visit. 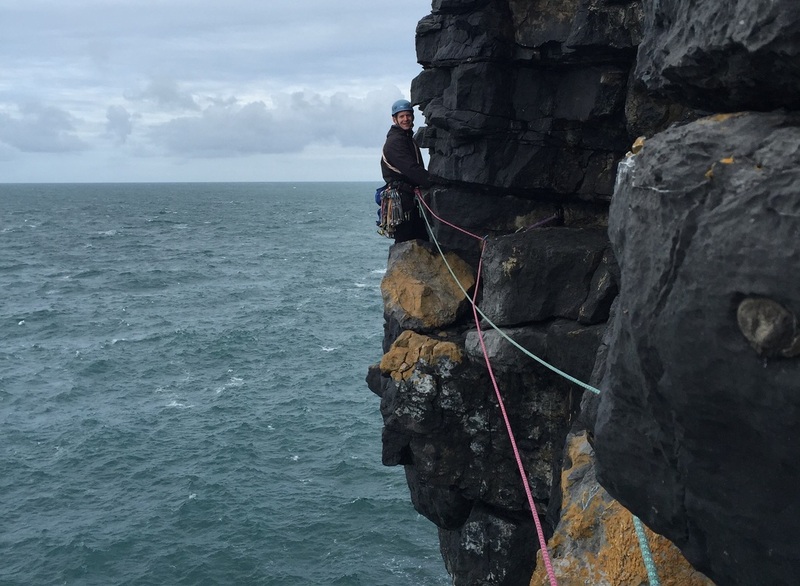 When that time came, we parked up at Stack Rocks and picked the Rainbow Bridge, a 3* S graded traverse leading into the S Promenade, as a warm up on Mount Sion East - a fantastic combination. 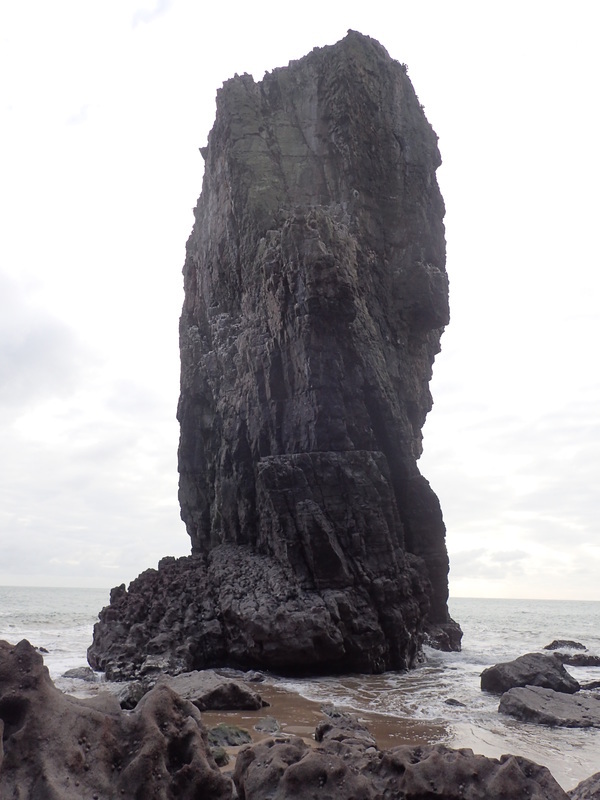 Then we walked to Pen-y-Holt bay in time to reach the stack as low tide approached. 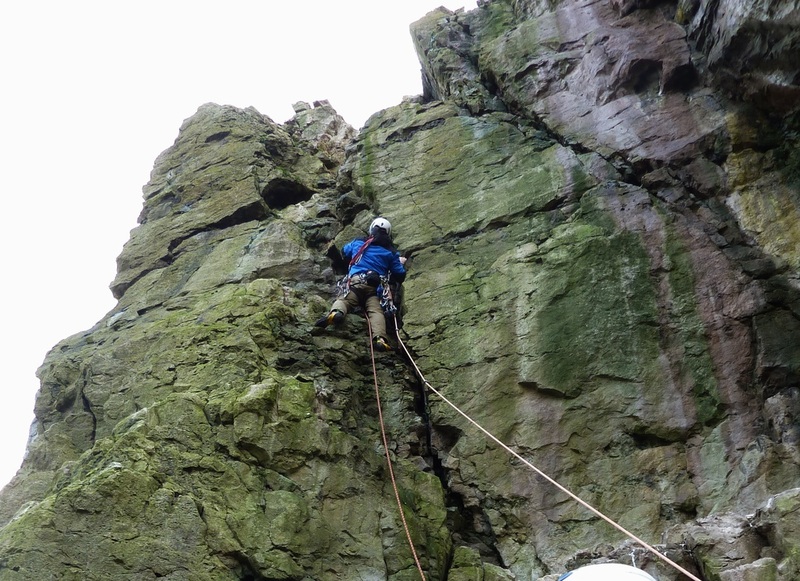 Access to the platform at the base was straightforward and there are a good selection of routes across the grades. 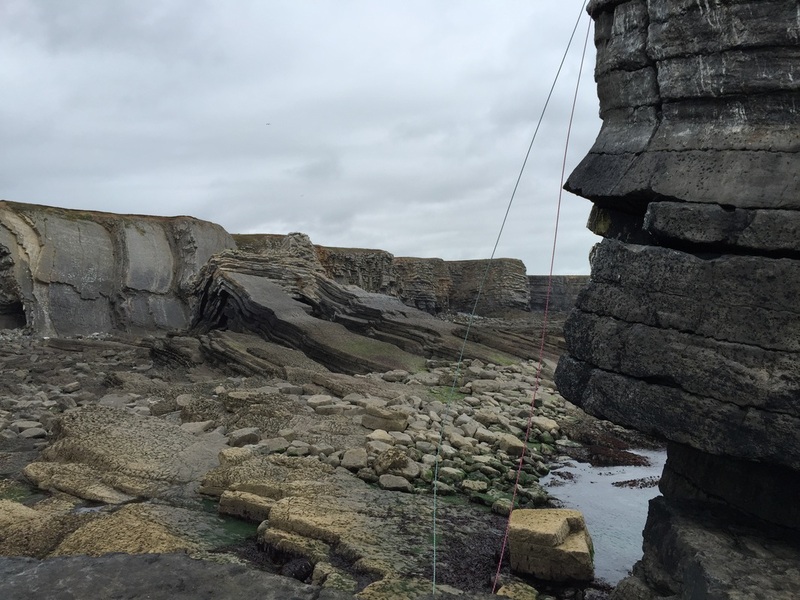 We picked House of Cards HVS 5a, which we shouldn’t have been surprised to discover featured some very large, loose sections of rock. 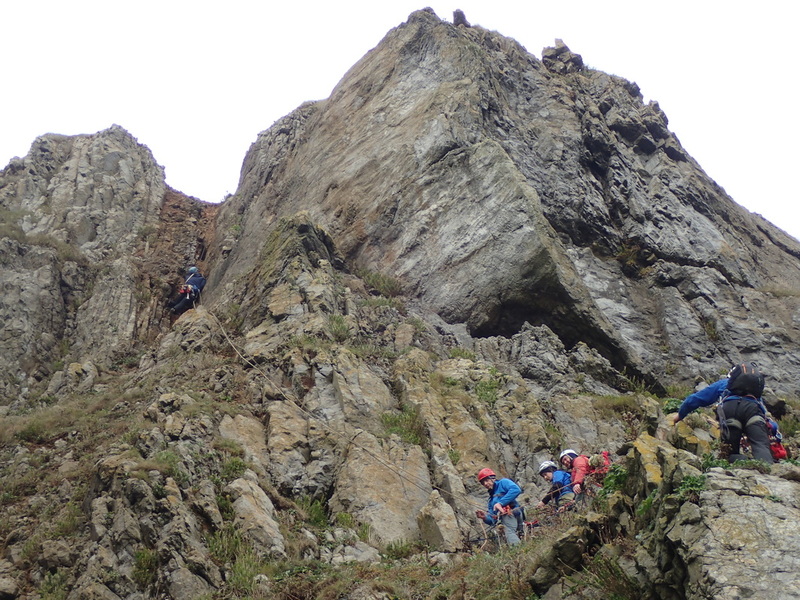 A good climb though, well lead by Harry and we were soon on the top with fantastic views down the coast. We rejected the fishing float abseil anchor and instead opted for a long piece of tat around blocks on the North West corner, taking care not to dislodge anything on the way down. 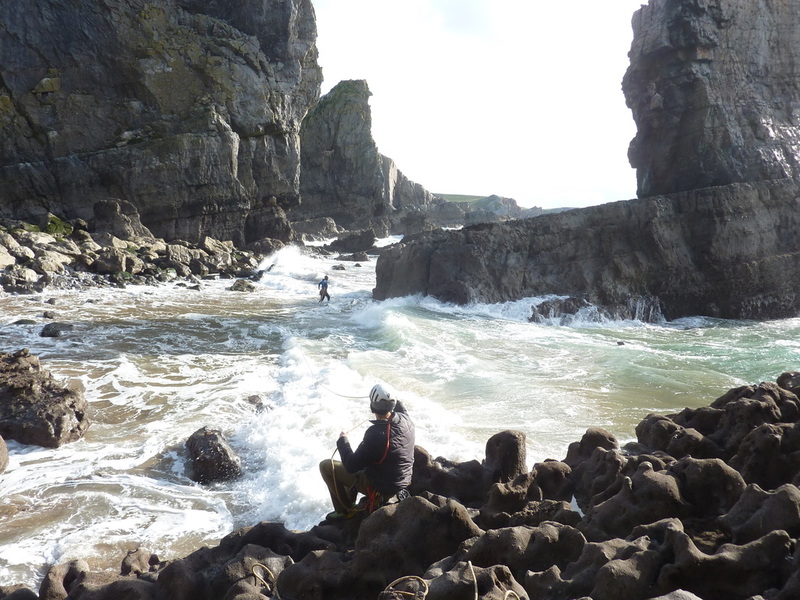 With our mind on the tide, we left the platform - though there was more than enough time for another a route - and instead enjoyed four routes on the Cabin Door Islet including Blue Klingon HVS 5a, before the sea reached us and we made our way back West across the bay. 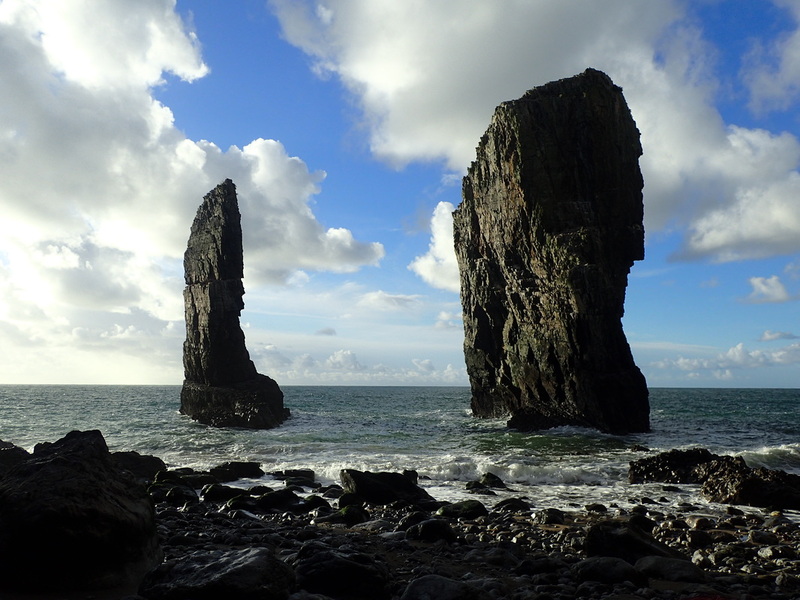 Walking out in the early evening, we looked back towards the stack, now surrounded by the sea. With Pen-y-Holt climbed, our thoughts turned to the Elegug stacks - that look far more forbidding even though they are amenably close to Stack Rocks car park, in the more easily accessible Range East. Although they feature in the Climber’s Club guide, other information regarding previous ascents seemed scarce. 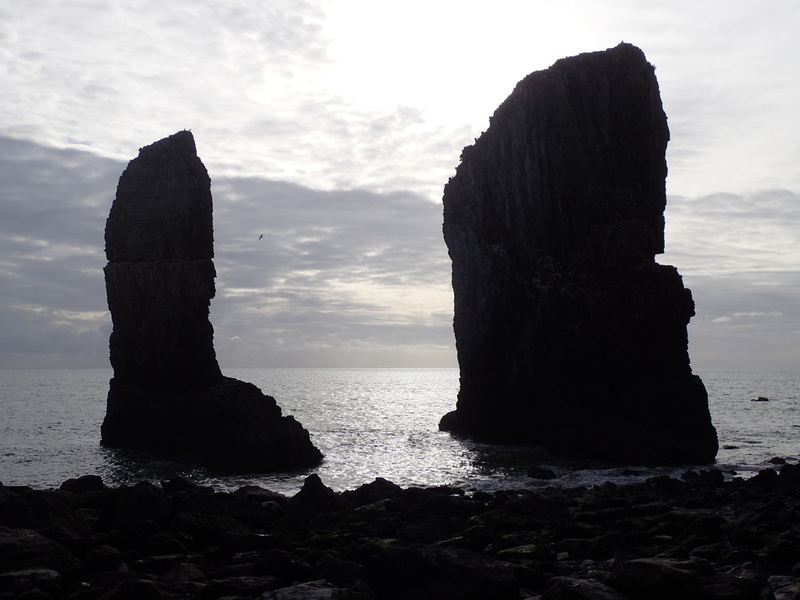 There is an account of the first ascent in John Cleare and Robin Collomb’s book, Sea Cliff Climbing in Britain, as well as more detail regarding the same in a sea stack feature also by John Cleare….but other than that, very little. 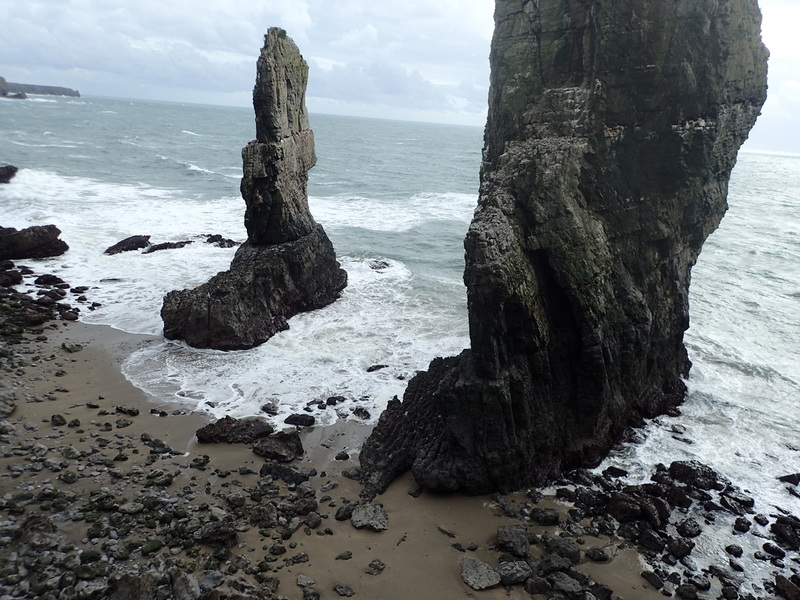 In the absence of a boat, looking at the stacks and the distances between them and the cliffs, it seemed like a Tyrolean between the cliffs and Elegug Tower…..then a second Tyrolean between the Tower and the Spire…..was the way to go. 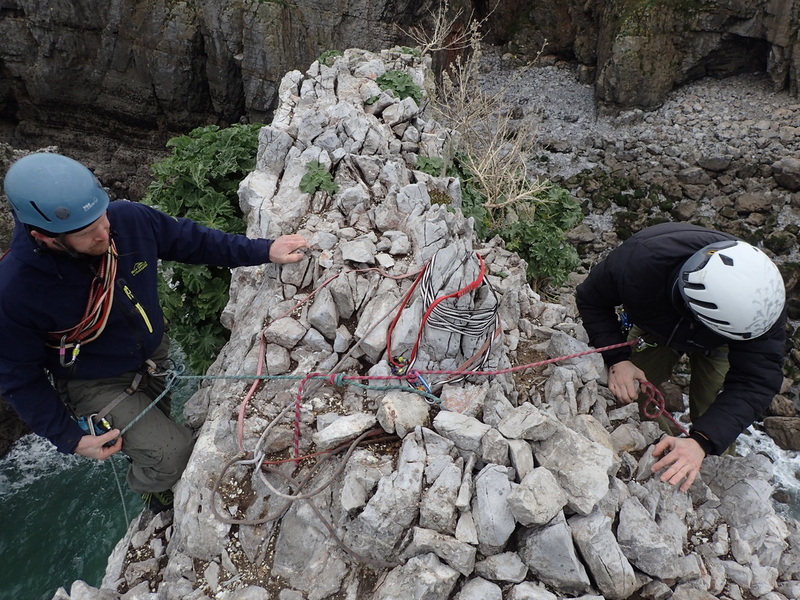 With these set up, we thought there would be enough time to complete one of the routes before we retreated to the bay and came back to climb the second stack the day after. While the plan was fairly sound, the execution left a little to be desired. 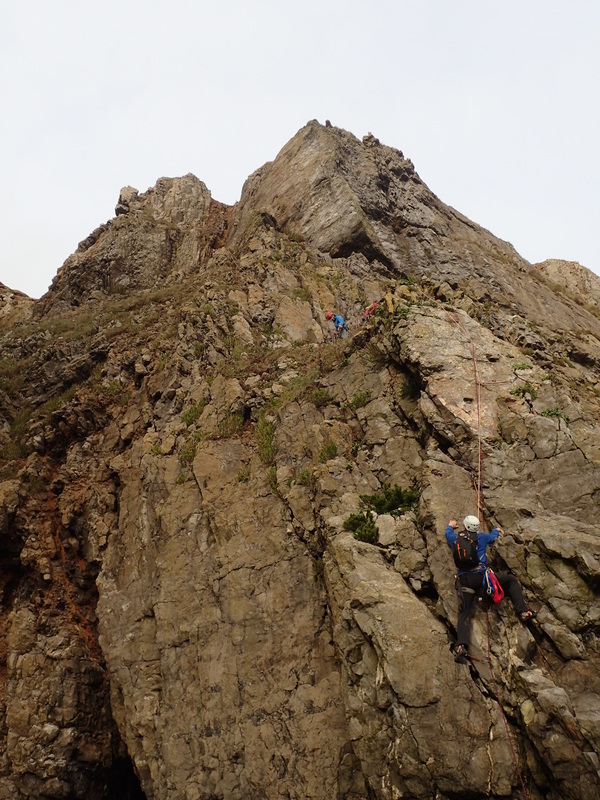 Having set up the Tyroleans, Andrew led the climb of the smaller stack via Elegug Spire VS 4c – a great first pitch, up from the landward side of the West face, then across the break to the seaward arête….though the second pitch to the top featured some very loose rock. On top, it was soon clear that there were no decent anchors, so we set up a counter balance abseil and descended back to the platform at the base of the stack. The ascent had gone well, but with the time taken to set up the Tyroleans and complete the climb, we had used up a lot of time and the sea was now well onto the boulder beach. The state of the sea and inadequate tension on the long Tyrolean line between the Spire and the Tower created issues with our retreat to the beach, that ultimately saw us in the water to varying degrees. We were now faced with the prospect of ascending the abseil line, free hanging for the last 30 metres….with the sea already pretty much at the bottom of the line, we turned our attention on the back wall of the bay, thinking it may be possible to force a line up through the loose rock, grass and mud. This was a mistake. The first pitch we climbed to half height was loose but manageable, though from the very beginning of the second pitch it was clear there was virtually no solid rock around as pretty much everything fell apart in our hands or gave way under our feet. A stressful attempt ultimately ended in an difficult retreat and the realisation we weren’t getting out that way. 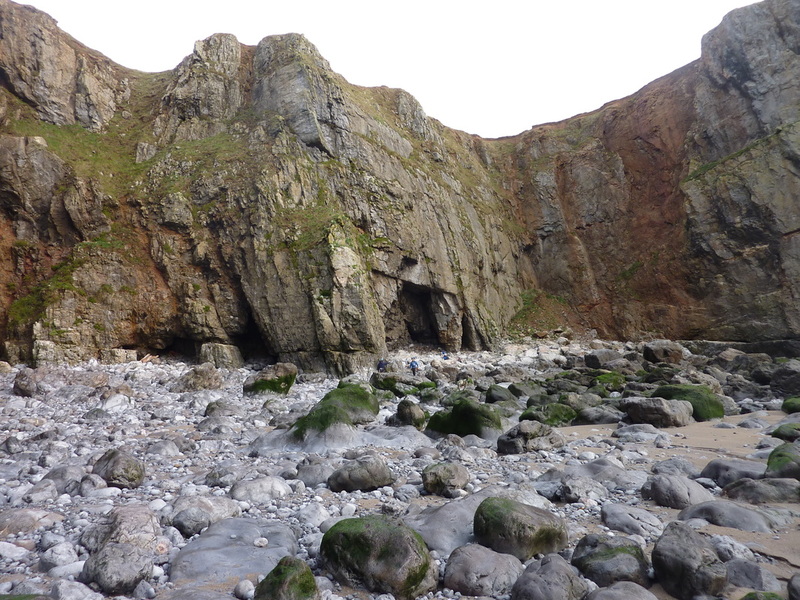 We abseiled back into the bay and decided to settle down for a long, cold night in the large cave at the back of the bay. 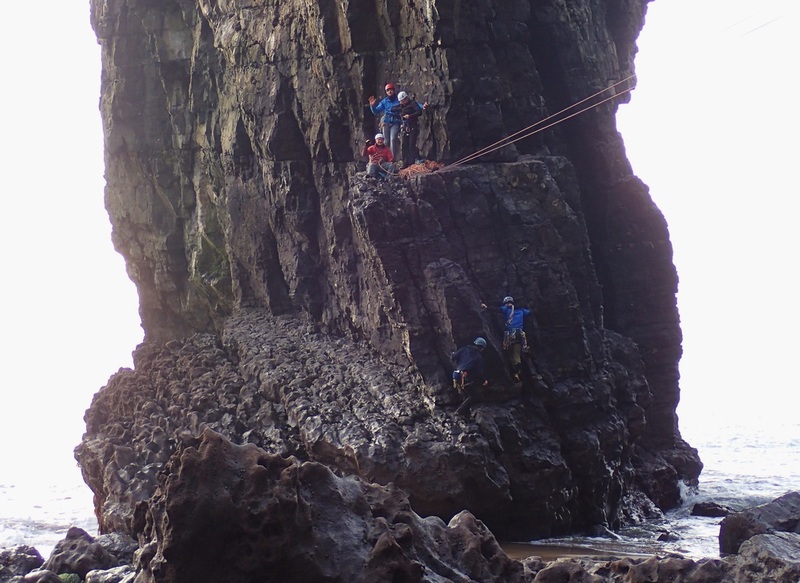 The next morning we revisited our options and having waited for the tide to go out and looked around the corner, we opted for Western Man VS 4c in favour of the abseil rope ascent. We should have made time to climb the Tower before we left, but after a cold night, decided to put our time into an exit. The first pitch was solid and enjoyable, the second pitch felt technically as difficult as the first, but very loose, with some strenuous moves among large wobbly blocks. It was a relief to be back on the cliff top. 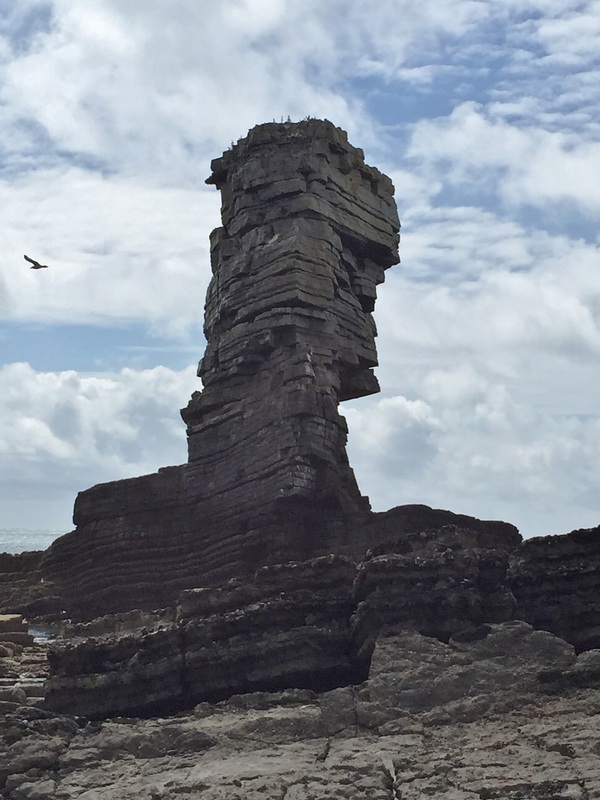 ​After that experience, it took some time before a return felt sensible, but this November, after a great day climbing at Stennis Head and Manzoku Wall, we decided to go back to climb the Tower. 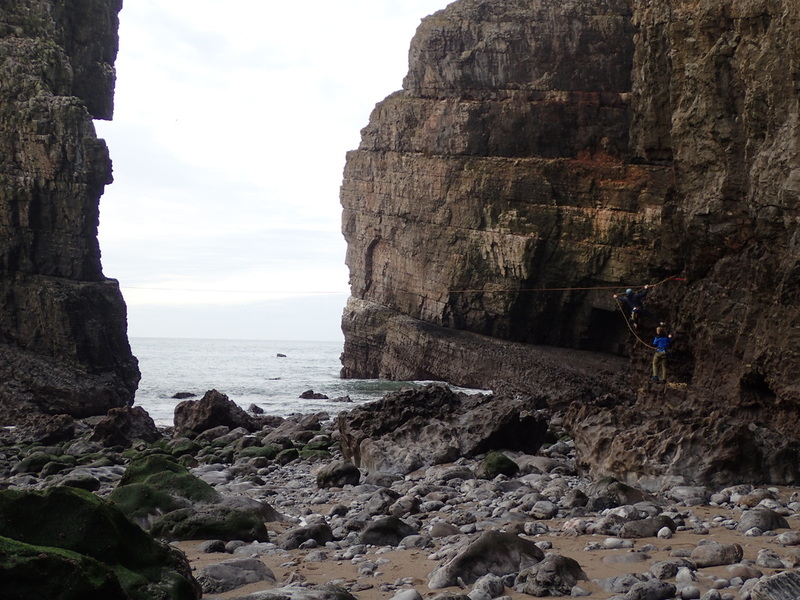 This time we abseiled the back wall of the bay, down our attempted escape route on the prior visit. The weather was good as were the tide times and low water levels. We quickly set up a Tyrolean from the cliffs to the Tower as a backup, but hoped to be on and off the stack before we needed it. The guidebook route description heads left from the platform c5 metres above low water, but we found a more amenable line on the West face that after a steep move, led up over clean solid rock to the loose half height platform. 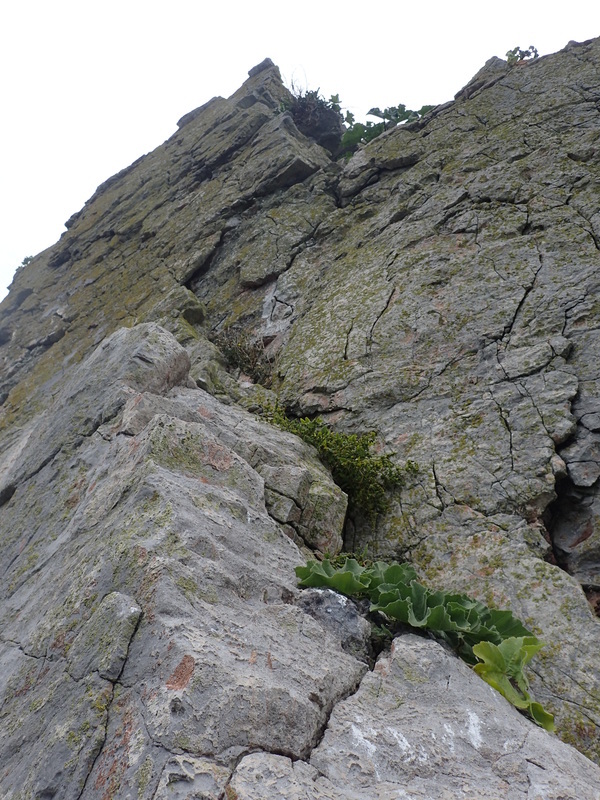 A slippery, green leftwards leaning crack led from there to the summit with a little more difficulty. 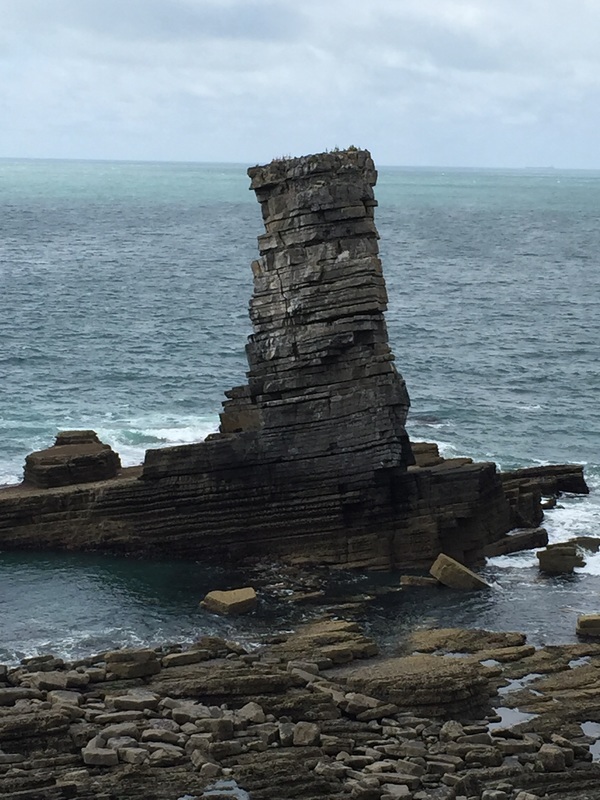 The top of the stack is large, with a small summit cairn and a number of old abseil anchors on the back sloping edge of the seaward side- brought back with fresh tat to the landward side. 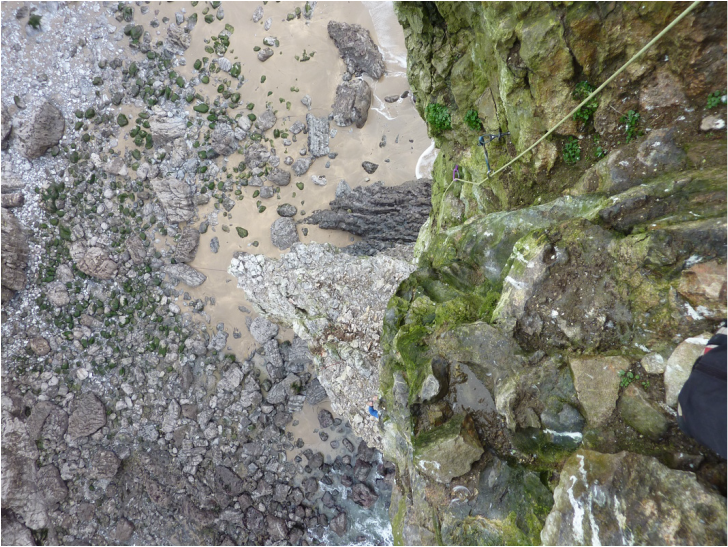 Two quick abseils and we were back at the base and then on the beach, without need for the Tyrolean. 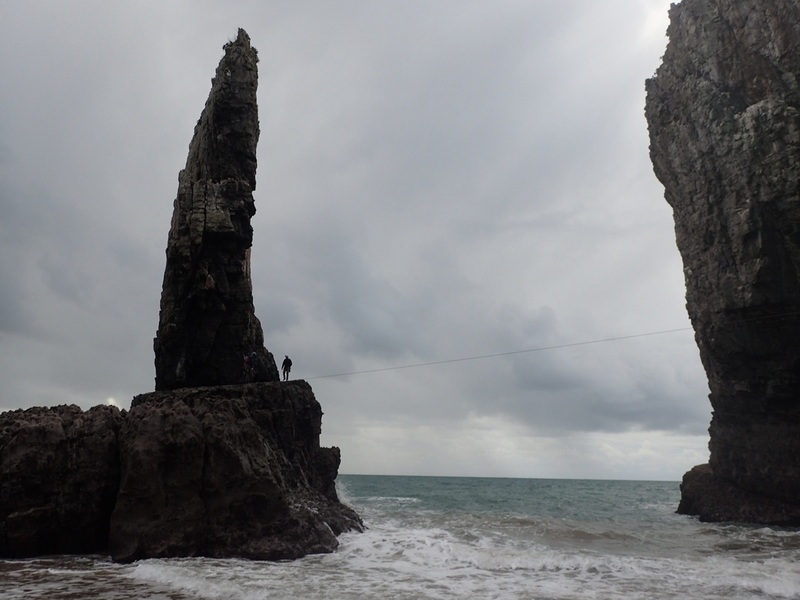 There was time to access the base of Western Man again, but we opted to take a few minutes in the bay and then ascend the line of our abseil using the rope for aid. 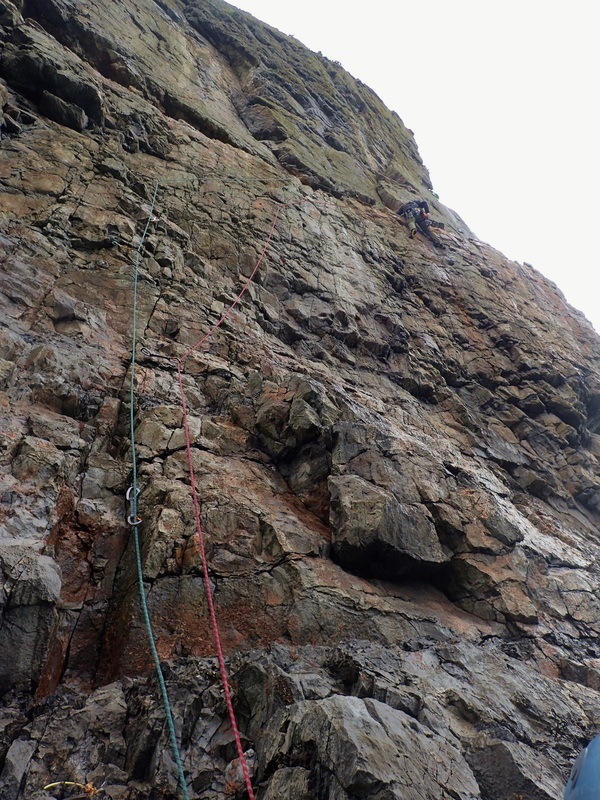 The first pitch went as before, with the second pitch as seriously loose as we remembered and we were forced to jumar the last 10+ metres of steep mud and loose rock in the chimney below the cliff top. Six of us climbed the Tower and it took almost 8 hours from beginning to end - a long time for essentially one route, but a fantastic adventure in a dramatic setting. Access restrictions due to firing are advised on Twitter @mod_dio and #modCastlemartin, though things can change so it’s always worth calling 01646 662367 for pre-recorded updates regarding public access - just prior to making your journey, to confirm the Range is open….as it can be closed at weekends as well as on week days. Apparently the range is open for recreation for part of the main holiday periods - around Christmas, some of April and most of August. 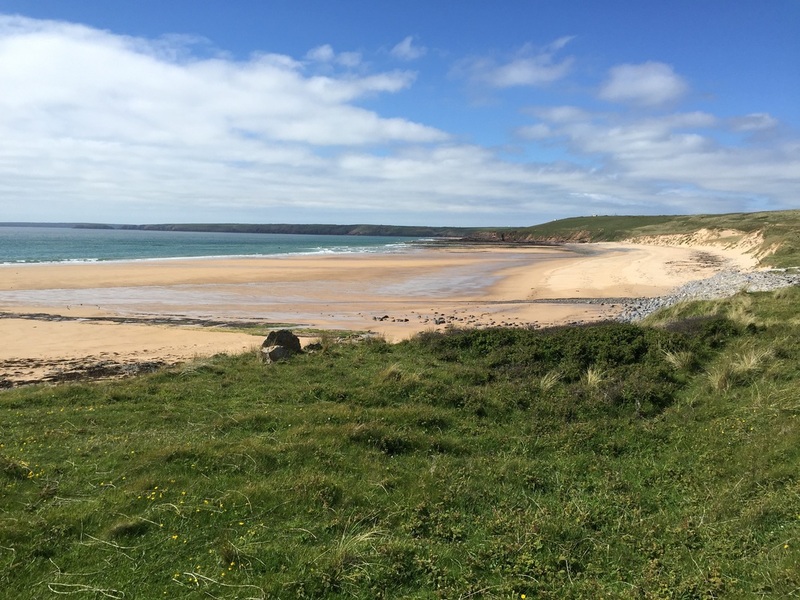 To enable access to the Range when it is open, you need to have attended one of the briefings at Castlemartin Army Camp. The dates and times of the briefing sessions are advised on the BMC website, though for 2017 are: 23/02/17 1800h, 25/02/17 1000h, 23/03/17 1800h, 25/03/17 1000h, 14/04/17 1000h (Good Friday), 27/04/17 1800h, 25/05/17 1800h (Bank Holiday weekend), 27/05/17 1000h. You need to arrive at the range gatehouse in plenty of time for the briefing, as you will be turned away if you are late. Once you have been to the briefing you can visit the gatehouse to get a daily photo pass - needed for each and every visit to the range. After a briefing, the ability to access the Range should last until the date of the last briefing in 2018. 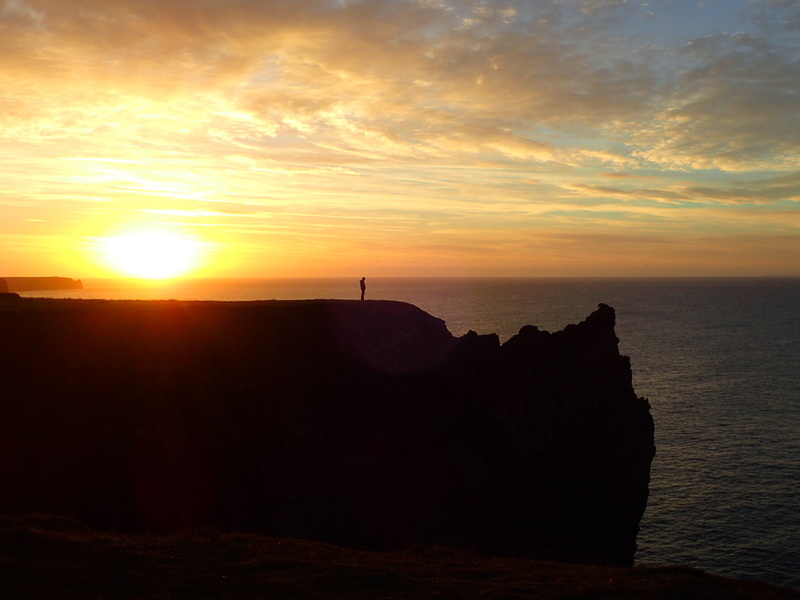 The stacks are subject to a nesting restriction from the 1st March to the 15th August and further details are again provided on the BMC Website. 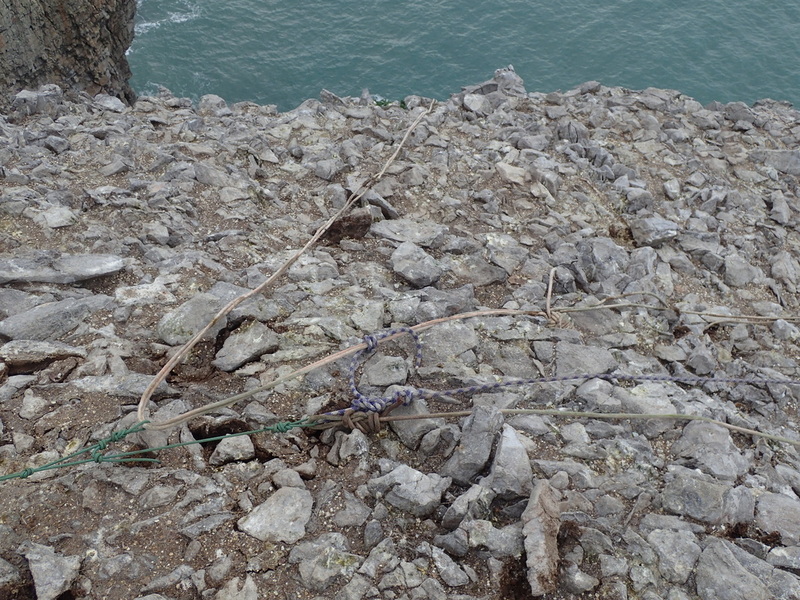 In addition to nesting restrictions, it is requested that climbers avoid disturbing seal colonies in the area from mid-Aug until mid-Oct. Hence the climbing window for these stacks is more like late October to February. 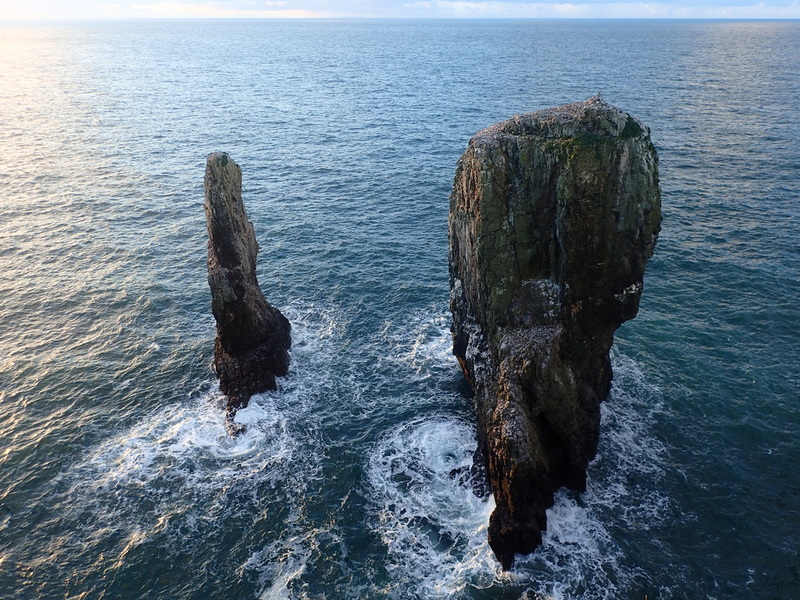 Much of the rock in the bay is very loose - on the stacks, the very unstable back wall and the top section of routes on the landward cliff to the West of Elegug Tower. 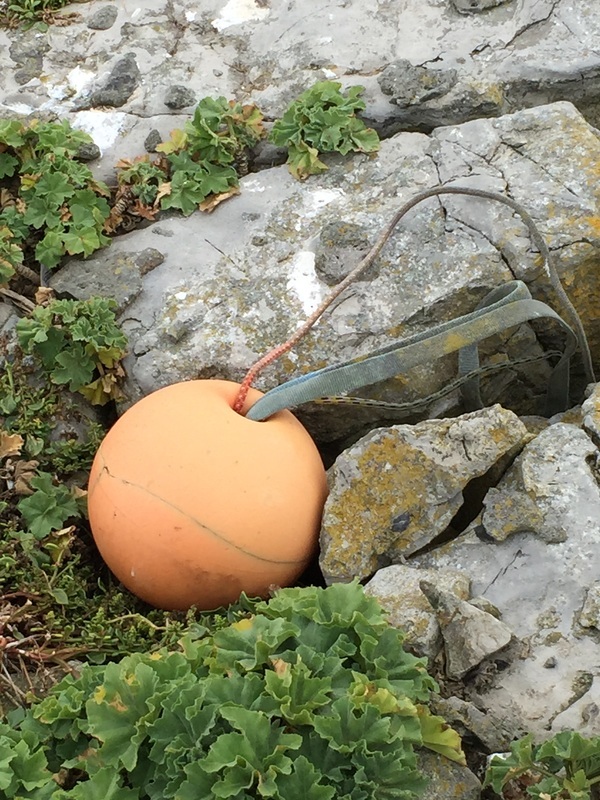 Be prepared for loose, unstable and falling rock as well as poor protection in places.